"Cuisine can't be exported like oil and gas"
Modern-day Russian chefs and restaurateurs have yet to agree on what exactly Russian cuisine is all about: an old-fashioned collection of babushkas’ recipes, a vestige of the Soviet past, or an international fusion – a result of globalization. At a food festival in Moscow’s Gorky Park, Shishkin was cooking paella from spelt, a low-yield kind of wheat that was widespread some 5,000 years ago. All other ingredients, including the cured ham, mushrooms, garlic, spices, and exotic spelt are homegrown in Russia – and the paella tastes distinctly Russian. 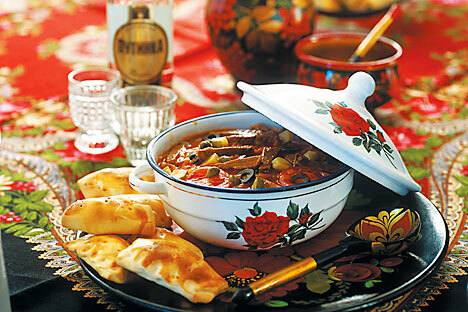 According to Shishkin, Russian cuisine is a combination of revived ancient rural dishes and contemporary Russian food, something Russians eat here and now. Traditional Russian ingredients include sauerkraut, turnips, black bread, and malt. For example, Shishkin makes the dough for ravioli out of Borodinsky black bread. The result, he says, is an amazing product with a clearly local taste but with an international, cosmopolitan look. “I can cook food that would feel at home in any country but I will use certain nuances, local products. I think that is exactly how a new Russian cuisine will emerge,” he said. Chef and restaurateur Alexei Zimin agrees that today’s living national cuisine cannot do without a fair share of cosmopolitism. The menu at his café Ragout lists curry side by side with ice cream made of beet and the ubiquitous Borodinsky bread, as well as fried zucchini alongside burgers. To the question regarding the place of Russian cuisine in international trends he answers: none – yet. As far as the Soviet period is concerned, Shishkin believes it was totally destructive. Like everything else at the time, the public catering system was very totalitarian. Add to this a system of government-set standards that nipped any initiative in the bud. That is why cooks forgot how to improvise. “I always prefer to hire a cook without Soviet experience, because the Soviet Union didn’t have any particular culinary school,” Shishkin said. Generally, interest in culinary history and culinary traditions been growing worldwide. But it translates into attempts to find unusual applications for very basic products, such as potatoes. According to Zimin, culinary purism is extinct both in Italy and in Spain.